Notts Allianceare past masters at getting an audience joining in not that we need to much prodding! Three guys who have an enviable reputation for tight and inventive harmony singing. They draw their material from a wide range of styles and are always adding to their repertoire. 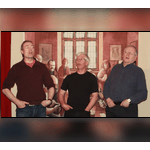 All sung with a love of performing and easy going humour.